Kentucky's Bluegrass is an exceptional place. Truly, it is. Whereas the state, as a whole, tends to suffer from both poverty and architectural impoverishment (like much of the South), the triangle of fertile farmland lying between Louisville, Maysville, and Stanford shelters what may be the finest concentration of antebellum buildings west of the Appalachians. Like quasi-Jeffersonian villas? You'll find them here. Multi-pen log structures? Ditto. Greek Revival temples? Likewise. Sprawling Italianate mansions? Yep. The region's incredible agricultural prosperity produced an incredible building stock — and one (seemingly) little-blunted by the Civil War and Reconstruction. Jessamine County sits at the southern edge of the so-called Inner Bluegrass, the central and most wealthy portion of the broader Bluegrass area. (Here lies Lexington, the "Athens of the West.") Not terribly far from the Lexington city boundary exists the Golf Club of the Bluegrass, which occupies a rural estate once known as Woodland. Woodland, along with many other Jessamine County farms, is listed on the National Register — but it's not well-publicized, in spite of its excellence. The centerpiece of Woodland is an 1889 mansion, commissioned by John Steele (1845–1918) and built in a transitional Italianate–Romanesque style. The round-arched portal, entrance tower, rusticated voussoirs, and semicircular balcony are all features more befitting public buildings than private ones — but then, this is the Bluegrass, where such a thing was possible. John Steele's residence (1889), now a golf-course clubhouse. Who built Woodland? I haven't a clue. The National Register nomination is disappointingly terse, giving only the most rudimentary information about the property's history. 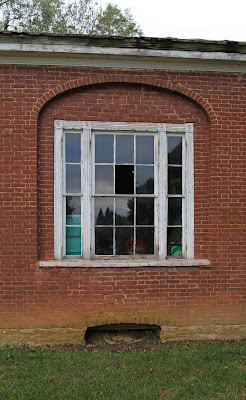 (One quirk: a child's handprint pressed into a brick sandwiched between two tower windows.) But there are two homes at Woodland — and this fact is what tips the property from the great to the exceptional. Tucked behind Steele's residence is a low brick structure (quite a contrast to its neighbor's buoyant upward thrust) no less interesting. Like the main house, it seems both to embrace and to smash the architectural norms of its era. It's clearly a Federal-period building, perhaps constructed about the time the British and the Americans fought their last battle, or even shortly before. It diverges from almost all other Jessamine County Federal homes, though, in its studiedness. 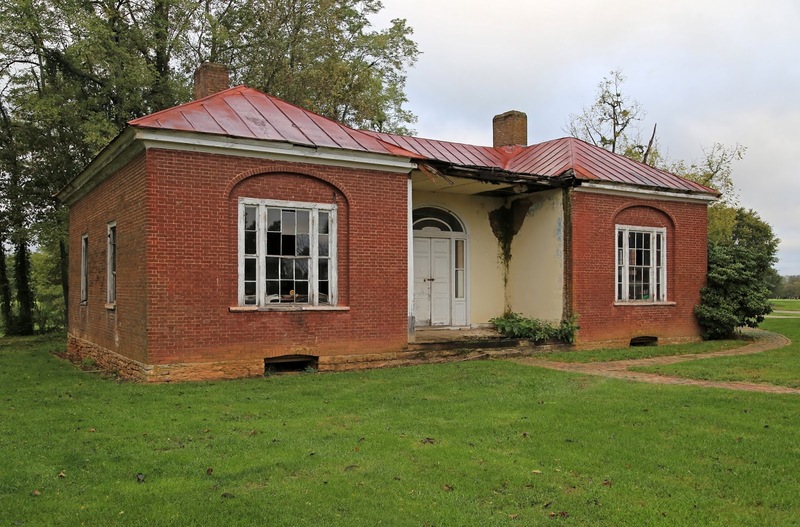 It doesn't make use of the panoply of traditional floor plans available to early Kentuckians (i.e., central- and side-passage arrangements, or the telescopic configuration pioneered in the Chesapeake). Rather, its five main rooms form an H-shaped footprint, with a service ell jutting to the side. Chimneys are placed between the front and back rooms. The partly enclosed areas formed by the H's hyphen function as porches. The house's finish is equally unusual. 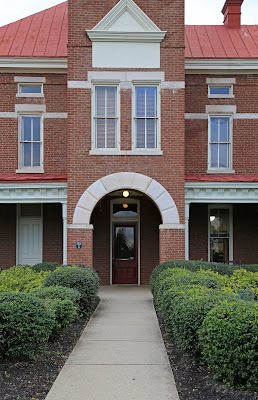 The facade features tripartite windows (very common in the Bluegrass) set within segmental-arched recesses (not common in the Bluegrass). 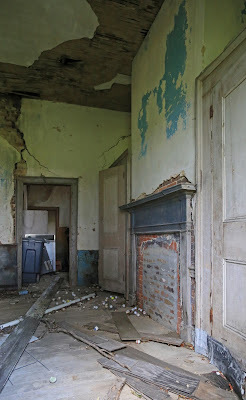 The entry consists of two four-panel doors flanked by sidelights and a fanlight (typical enough), but the porch area is plastered as if an interior room. (This treatment reminds me of the Latrobe-designed Pope Villa's entrance.) The cornice has a usual Federal profile. Unfortunately, the building has fallen into terrible disrepair. ('Twas long thus — as early as 1977, it served as a storage space.) 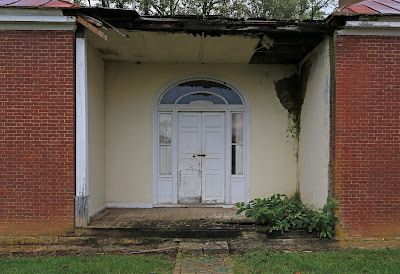 Both porch's roofs and floors are failing spectacularly, interior plaster is falling from the ceilings and walls, several windows are entirely nonexistent, the foundation appears to be sinking, and much woodwork is missing. (No trim remains in the northeastern room.) 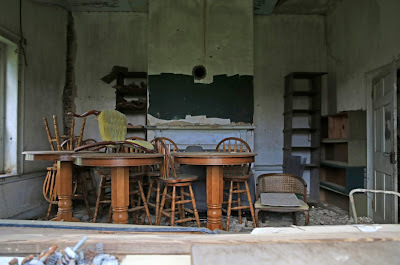 A glance through the windows reveals jumbled heaps of furniture, planks, plaster dust, and golf balls. Who designed it? And for whom? Again, mostly silence. The nomination form attributes its initial ownership to a Mason Singleton. My quick perusal of genealogical sites yielded a bit of information. A Mason Singleton (1804–1894) almost certainly owned the property, but he seems too young to have commissioned the home. His father, Manoah Mason Singleton, Jr. (1773–1833), was more likely the first owner. The Singleton family hailed from Spotsylvania County, Virginia — no doubt a source of many Bluegrass settlers. For a time, Manoah resided with his parents at Bryan Station, a fortified encampment which stood north of Lexington (and predated the city's founding). 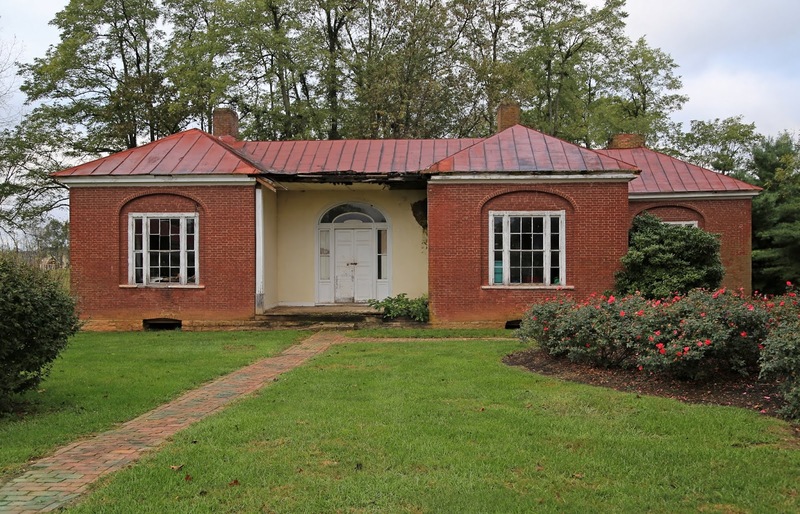 So, a quasi-Palladian cottage — the sort of thing a Jefferson or Latrobe might design for a less-prominent client, and a building associated with one of Jessamine County's founding families — lies moldering behind the lovingly maintained mansion which replaced it. Such is the Bluegrass. Alas, I'm not optimistic about the building's long-term survival. Restoring it would require a six-figure (or more) investment — not merely a bit of repainting and refinishing, but a complete reconstruction. Bricks would need to be relaid; woodwork, replaned; and walls, replastered. Is it worth the money? I hope so. But only the Golf Club of the Bluegrass can make such a judgment. One of these decades, I'll summon the energy to write a book about Ohio's cultural landscape — something akin to the excellent Roadside Geology series, but for buildings. It'll no doubt contain a county-by-county discussion of architectural trends. Such chapters will probably resemble this blog post. Organized in summer 1797 and named for the sitting U.S. president, Adams is Ohio’s third-oldest county — and its cultural landscape betrays the fact. It is, in its natural geography, a place of variety. From west to east, the clayey and mildly broken landscape gives way to thin-soiled knobs (north of West Union), cliff-rimmed plateaus, the deep valley of Brush Creek, and the most rugged portion of Appalachian Ohio. To the south flows the Ohio River, whose fertile bottomlands supported Adams County’s earliest settlements. In the southwest, near Bentonville and in Sprigg Township, limestone outcroppings dot the rolling, sinkhole-pockmarked countryside — a rare region of karst topography and part of a small incursion of the Bluegrass into the Buckeye State. Adams County Courthouse, 1911; West Union. Historically, Adams County’s agricultural situation varied as much as its landscape. One early Ohio gazetteer notes that “[t]he land . . . embraces a variety of soils, from the best to the worst.” This is plainly true. Into the latter category falls the valley of the Ohio River — relatively narrow except near Sandy Springs, at Adams County’s southeastern corner. The passably fertile land surrounding Cherry Fork, Winchester, and Seaman, in the west, supported the crops common to southern Ohio. Throughout the county, pasture was (and is) common. As in nearby Brown and Clermont counties, tobacco cultivation flourished after the Civil War — particularly in the narrow eastern stream valleys, which remained sparsely populated until the nineteenth century’s closing decades. European settlement began in Adams County well before the subdivision received its name. In 1790, Nathaniel Massie (1763–1813), a Virginia-born surveyor, crossed the Ohio River near the mouth of Isaac’s Creek and established an outpost, known first as Massie’s Station and soon rechristened Manchester. With Massie came a contingent of settlers — the first legal residents of the Virginia Military District, in which Adams County wholly lies. Not until the Treaty of Greenville (1795), though, could settlers live without fear of Native American retaliation. Between 1790 and 1795, several Manchesterites — including members of the Ellison and Edgington families — were either attacked or captured by local tribes. In the ensuing decade, Europeans trickled into the area, mostly establishing subsistence farms in the valleys of the Ohio River and Brush Creek. In 1796 and 1797, Colonel Ebenezer Zane cut the eponymous Zane’s Trace through the soon-to-be county from northeast to southwest. About this time, when the Northwest Territory’s legislature decided to establish Adams County, it selected Manchester, naturally, as the seat of government. This decision proved fractious. 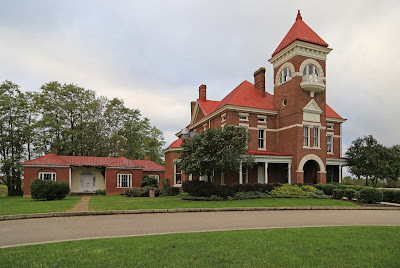 Within a year, and after much bickering, the county commissioners had uprooted and repositioned themselves twice — first from Manchester to Adamsville, a comparatively remote site on the banks of Brush Creek; and thence to a two-story log courthouse in Washington, a nascent Ohio River community. In 1804, the Adams County government moved yet again, this time to West Union, a newly platted village perched on a hilltop several miles inland. For once, the choice stuck. Adamsville and Washington faded to nonexistence, while West Union prospered. By 1810, 229 souls called the community home. 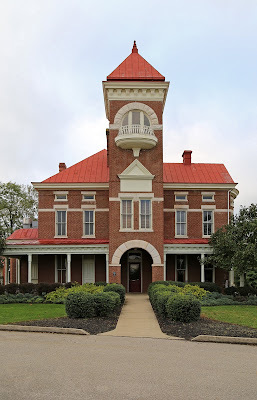 Future Kentucky governor Thomas Metcalfe (1780–1855), a mason by trade, built a new courthouse — a two-story stone structure of almost residential appearance, with exterior chimneys and a round-arched Federal-style entry — in 1811. West Union’s rapid growth and mid-century stagnation (its population remained almost unchanged between 1830 and 1870) left behind a well-preserved early townscape — one rich in Federal-era commercial buildings and residences, and even a smattering of log structures. Since the 1960s, though, waves of remodeling and demolition have robbed the village of most of these buildings. As West Union’s fortunes declined, Manchester’s rose — thanks to its riverside siting, which allowed it to become a shipping point for tobacco and other agricultural goods — and its population leaped from scarcely 400 (at mid-century) to nearly 1,000 (two decades later). The 1900 census recorded a population of 2,003. Thereafter, the village’s economy suffered. Both demolition and repeated flooding have left Manchester’s cultural landscape pockmarked, with mobile homes and vacant lots in lieu of a historic housing stock. Other sizable Adams County communities — including Winchester, Seaman, and Peebles — owe their economies, if not their existence, to the Norfolk and Western Railway, which was constructed in the 1870s. Smaller communities, some unplatted, dot the Adams County landscape. At least two distinct migration waves peopled Adams County. The first occurred between 1797 and 1820; the second spanned the 1840s. In both cases, the waves brought a relatively homogenous contingent of settlers, predominantly Presbyterians of Scots–Irish descent. The majority came from Pennsylvania (both the southeast and southwest) and northwestern Virginia, and a sizable minority immigrated directly from Northern Ireland. A few Kentuckians spilled across the Ohio River into the southern townships, and a smaller number of Germans scattered themselves across the county. In the 1870s and 1880s, a third, mostly internal migration occurred; inhabitants of southern Clermont County and Brown County, Ohio — where burley tobacco had become a staple crop — flooded into the mountain hollows surrounding Blue Creek and Wamsley, in Jefferson Township. The Adams County settlement landscape is not as diverse as those of other Ohio counties. In general, Virginians tended to dominate in the north, whereas Pennsylvanians and Kentuckians formed a majority in the south. By the end of the nineteenth century, foreign-born Scots–Irish populations were confined mostly to pockets around West Union and in Monroe Township. Adams County retains an unusual number of early buildings — perhaps an unsurprising fact, given that it functioned as a locus of settlement during the territorial period. For the most part, these structures make use of common vernacular forms. On the banks of Brush Creek, not far from the Zane’s Trace right-of-way, stands a single-pen log house reportedly built by Peter Shoemaker (d. 1804 or 1809), who settled in Meigs Township in 1796. In appearance, the house is standard — one-and-a-half stories in height, three bays in width, and adorned only with an external brick chimney. A two-story braced-frame addition, built at an early date by a member of the Sproull family, significantly enlarges the building. 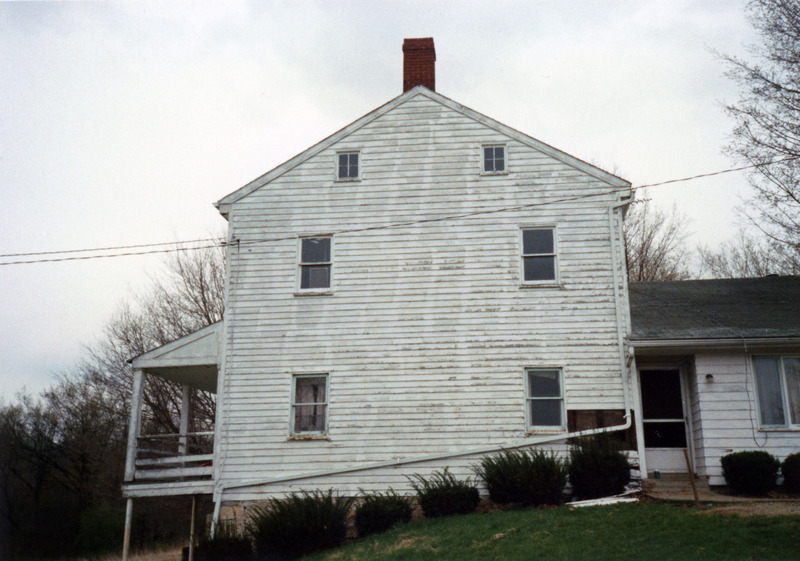 Though evidence for the claim is circumstantial, Shoemaker’s home may be Adams County’s oldest surviving residence. Shoemaker–Sproull House, circa 1796 (? ); Meigs Township. Another surviving eighteenth-century log structure is the National Register-listed Treber Inn, built by John Treber, a Pennsylvanian, along Zane’s Trace in 1798. The single-pen building — notable for both its two-story front porch (perhaps original) and its rear stone addition, appended about 1810 — functioned as a tavern for much of the nineteenth century. Thankfully, it remains more-or-less unaltered, preserved in almost museum-esque fashion by its present owners. Treber Inn, 1798; Tiffin Township. More typologically distinct was Buckeye Station, a residence surveyor Nathaniel Massie erected on a Monroe Township bluff in 1797. 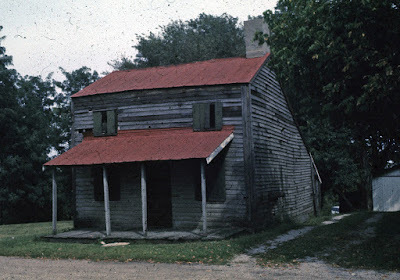 The house was a one-story, two-bay braced-frame structure of L-shaped plan, its front section divided by a massive central chimney — possibly an early variant of the “saddlebag” plan. A second stone chimney, placed on the exterior, accompanied the kitchen wing. What little interior ornamentation Massie’s abode boasted disappeared during its long life as a tenant house, but the exterior remained almost unchanged. The building’s eaves may have employed a system of framing more common to the eastern seaboard than to Ohio. Alas, a half-century of neglect has reduced Buckeye Station to little more than a pile of moldering boards punctured by a pair of stone chimneys. Nathaniel Massie House (Buckeye Station), 1797; Monroe Township. Photo by E.F. Schrand and A.R. Arend, 1936, from the Historic American Buildings Survey collection. 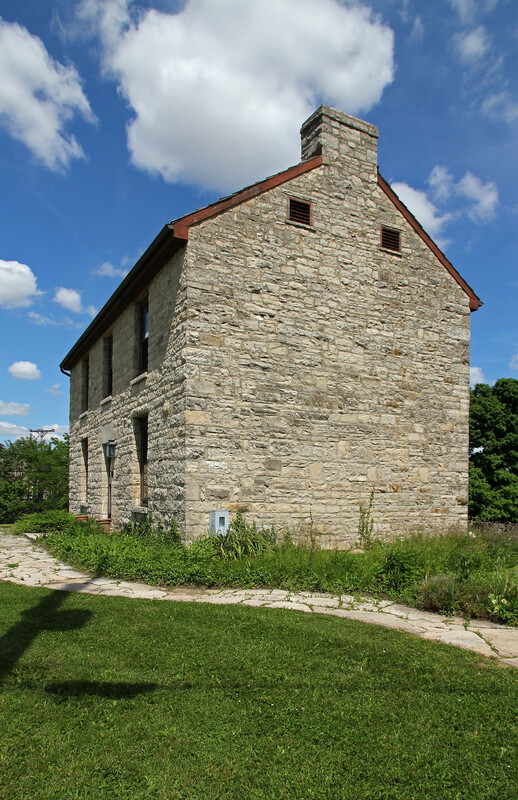 Adams County retains several early limestone dwellings. The oldest among these is no doubt the 1798 Andrew Ellison House, which stands in a narrow hollow northeast of West Union and scarcely a mile from Zane’s Trace. Ellison, born in County Tyrone, Ireland, was among the early residents of Manchester. 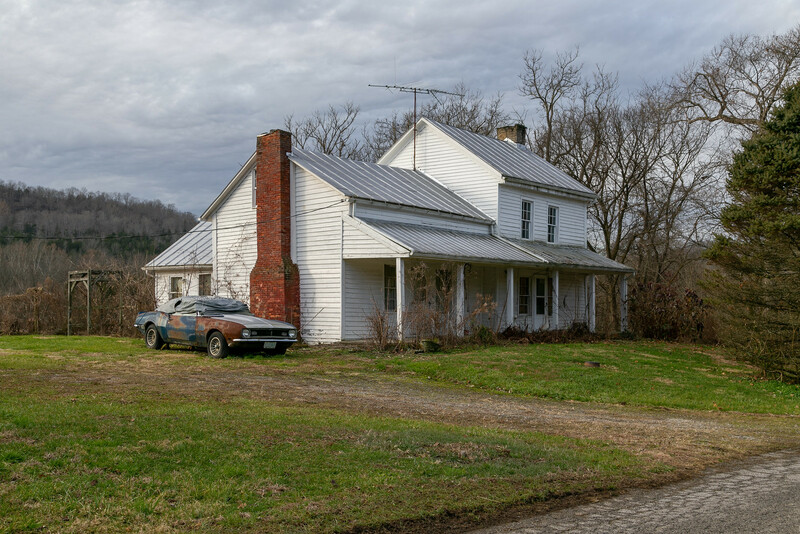 With its single-pen form, wide-based exterior chimneys, and primitive appearance, the one-and-a-half-story home betrays its pre-statehood origin. Its low-pitched roof and relatively lengthy side walls give it an appearance like that of other stone dwellings in nearby northern Kentucky — evidence of a regional trend, perhaps. 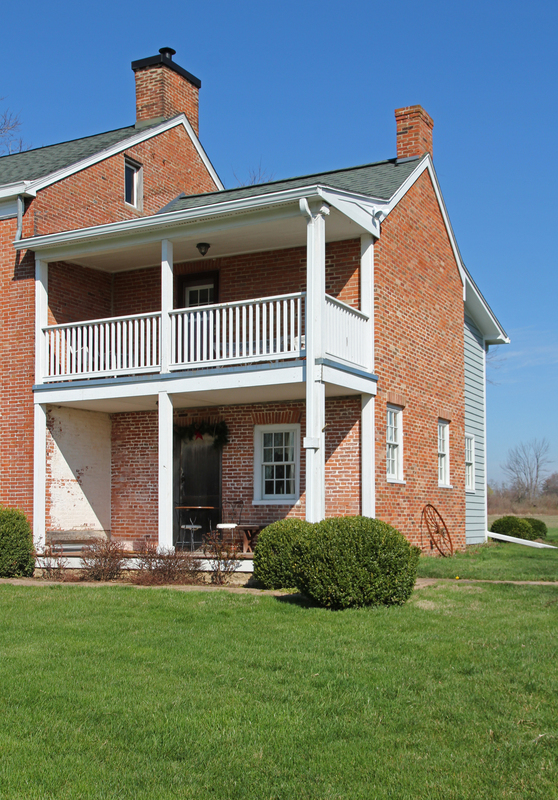 A slightly smaller, slightly later (1805) stone farmhouse stands in Liberty Township on land homesteaded by Thomas Kirker (1760–1837), another Tyrone native who later served as Ohio’s second governor. Like the Ellison House, Kirker’s residence is of essentially hall-and-parlor plan, albeit with a central (rather than a gable-end) chimney. In the 1850s, Kirker’s descendants enlarged the home with a two-story frame addition of “I-house” form. Two other Adams County stone homes survived into recent decades — a small, single-pen farmhouse in Scott Township, and a two-story stone-and-frame tavern built by one Isaac Aerl before 1810, just north of Peebles. Aerl’s tavern is noteworthy for its crude Flemish-bond stonework. 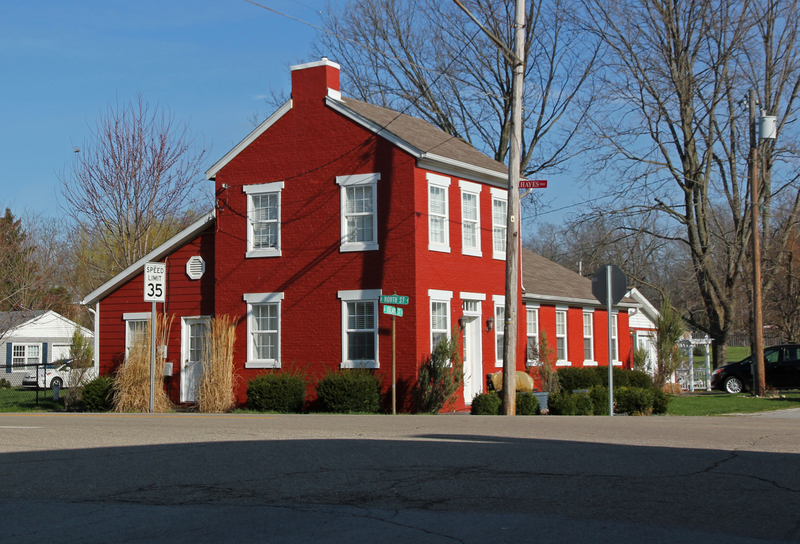 Andrew Ellison House, 1798; Tiffin Township. Isaac Aerl House, circa 1809; Meigs Township. Because of Adams County’s isolation and relative poverty, log construction remained popular in the area well into the nineteenth century. (Indeed, a few log homes date from the twentieth century.) 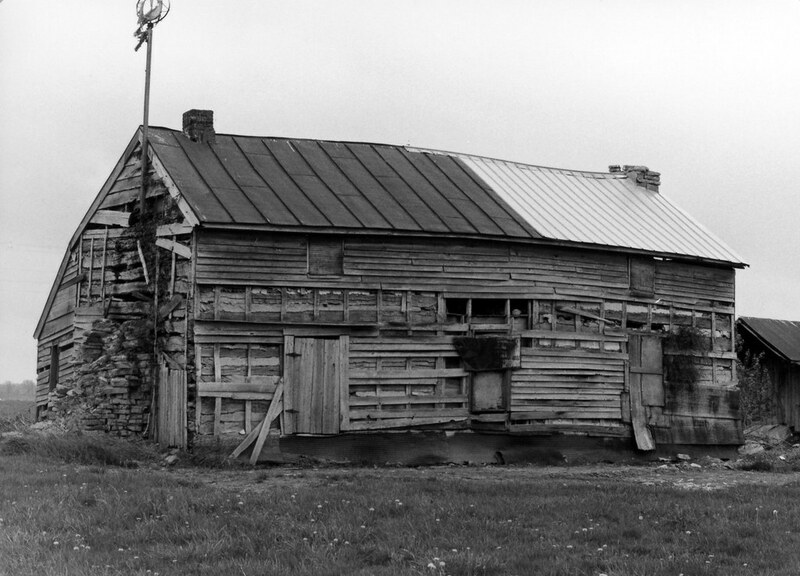 By far, the majority of the county’s surviving log buildings are one-and-a-half- and two-story single-pen residences; double-pen structures and outbuildings are considerably rarer. If preliminary surveys are any indication, the number of log homes surviving in Adams County exceeds 100. 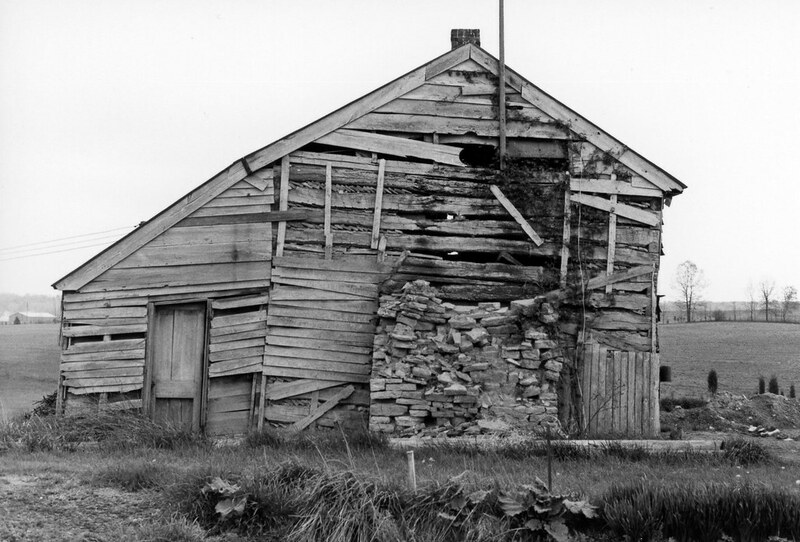 A WPA survey of farm residences, conducted in 1934, located 250 log homes — about 11 percent of Adams County’s total. No features distinguish the county’s log houses, in general, from those elsewhere, but overhanging plates and exterior chimneys seem to have been common. 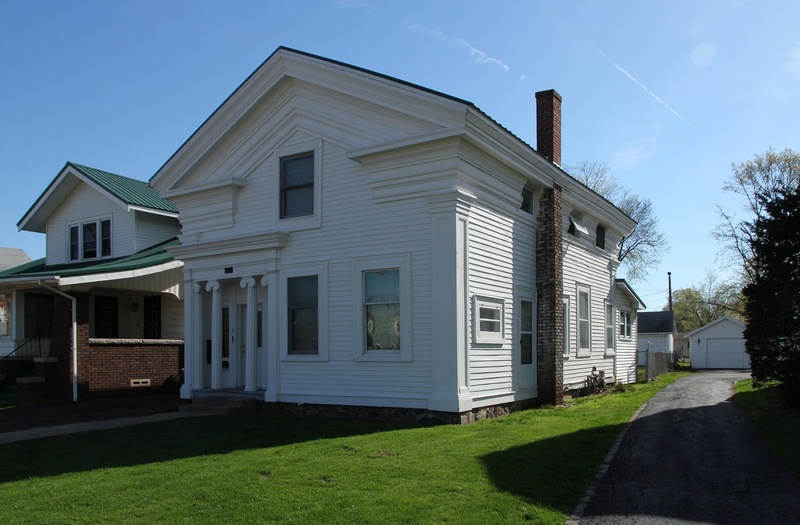 One double-pen home of “saddlebag” form, exceedingly rare in Ohio, stands in Sprigg Township. Another double-pen farmhouse once sat north of West Union, in Tiffin Township. Though its configuration — two one-and-a-half-story pens separated by a wide stair hall — suggested an early construction date, the building’s placement in an agriculturally marginal area makes this conjecture less likely. Whatever its origin, the house was a stellar example of early-nineteenth-century construction practices, with interior and exterior chimneys, rake boards, wide clapboard siding, and an integral rear porch tucked between enclosed corner rooms. This building, owned in the 1880s by a member of the Cluxton family, survived into the mid-1990s. Daniel Collier House, 1802; Tiffin Township. Razed. Photo by Rita or Leland Puttcamp, from Historic Landmarks in Ohio: Volume III, compiled by several chapters of the United States Daughters of 1812 in 1955. Cluxton Log House; Tiffin Township. Razed. Photo by Stephen Kelley, 1977, from the collection of Donald and Jean Hutslar. 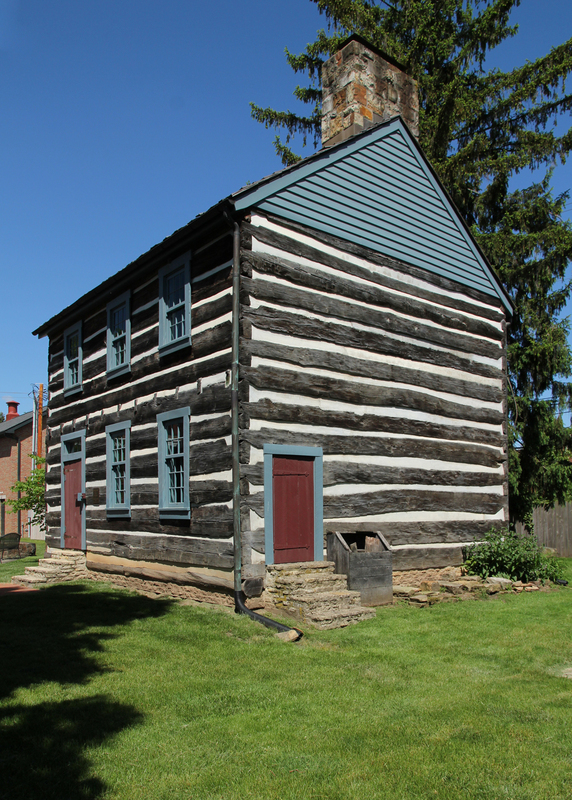 Like other Ohio River counties, Adams County contains a few examples of plank construction—an uncommon variant of the usual notched-log system which uses narrow, sawed boards instead of hewed timbers. In two cases, such plank structures were mere additions to more traditional log houses. In another case, notched planks constituted the entire single-pen home. Only one of these three buildings remains standing — on U.S. Highway 52, just southwest of Manchester. As is the case elsewhere in Appalachia, wood is, by far, the most common construction material among Adams County structures. Some homes use hewed logs; at least one, round logs. 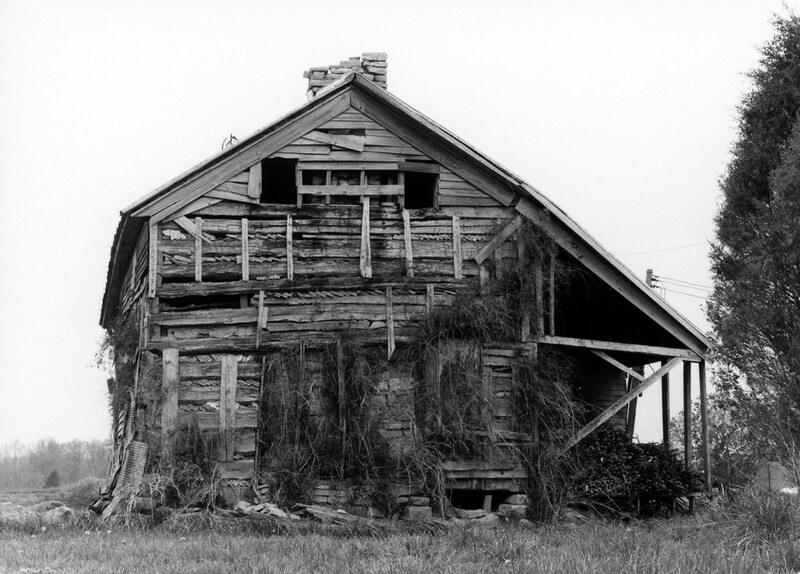 Most surviving pre-World War II residences, though, employ one of the two systems of framing common in America — braced framing, with its mortise-and-tenon joinery; and balloon framing, which reached Adams County after the Civil War. The county retains fewer than half a dozen stone structures, all ancient by state standards. Brick buildings — mostly built between the 1820s and 1850s — tend to cluster in the northwest (around Seaman), and in the upland valley which shelters Peebles. The county’s oldest brick structure, the 1801 Wickerham Inn — a low two-story, three-bay Flemish-bond structure, slightly altered — stands along the old Zane’s Trace between Peebles and Locust Grove. Wickerham Inn, 1801; Franklin Township. Photo from Wikimedia Commons, courtesy of Nyttend. Typologically, Adams County’s buildings fall firmly into the architectural tradition of the greater Upper South. Single-pen and hall-and-parlor homes, typically one-and-a-half stories in height, abound. Two-story residences of linear plan — so-called “I-houses” — constitute more than a third of the county’s surviving farm dwellings. Also common are one-and-a-half-story, double-pile homes of a type seemingly common to areas settled by the Scots–Irish. These buildings often consist of four rooms arranged around a central hallway, with chimneys (generally four, and sometimes two) placed at the periphery. The upper half-story invariably lacks a knee wall. Such homes, it seems, were constructed in great numbers about the time of the Civil War, and many feature (or featured) simplified Gothic Revival ornamentation — centered gables, lancet-arched windows, and bargeboards. In a few cases, the gable is front-facing. Of the homes depicted in Caldwell’s 1880 Illustrated Historical Atlas of Adams County, Ohio, more than a dozen fall into this category. Common late-nineteenth-century building-types also make an appearance — “gabled ell” cottages, cube-shaped dwellings, and whatnot. 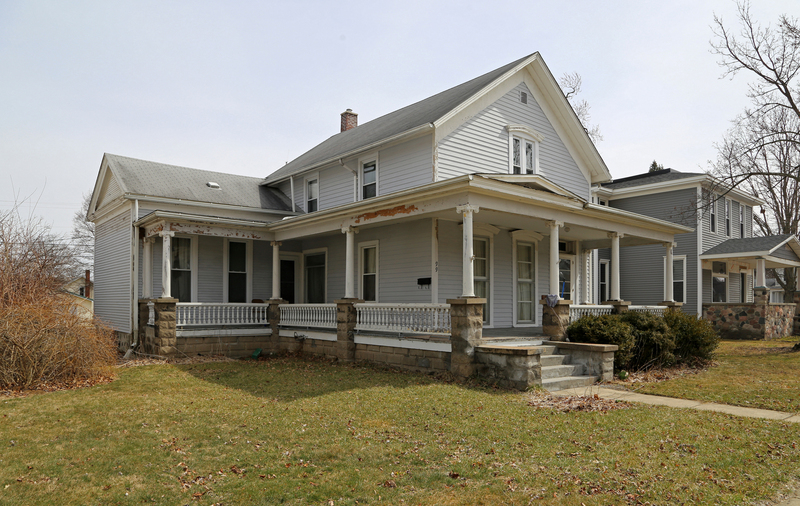 Few Adams County homes merit stylistic classification. Ornamentation tends to be vernacular, and not high-style, in nature. Among frame buildings, clapboard siding and simple frieze boards are omnipresent. The Federal mode, for the most part, is evident only in interior woodwork and the occasional use of Flemish-bond masonry. Nods to the later Greek Revival style are only slightly more common. 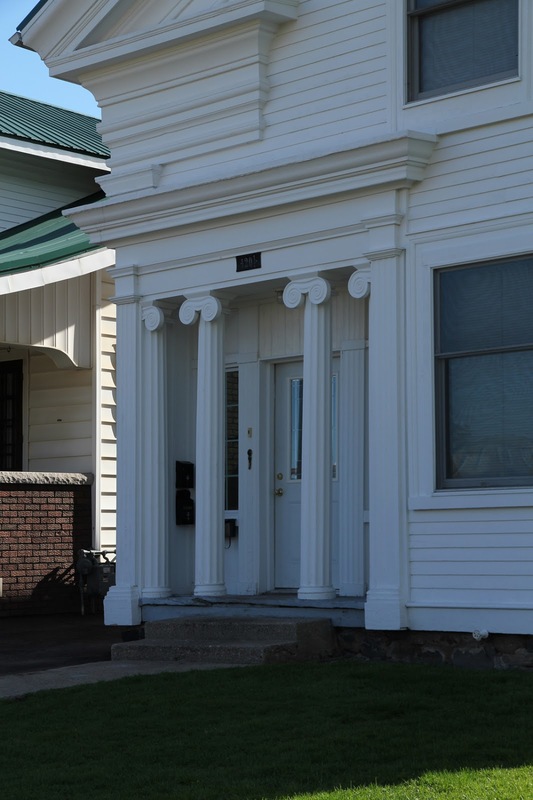 In Bratton Township, not far from the Highland County border, stands a five-bay frame “I-house” marked by a pedimented two-story porch with paired columns. 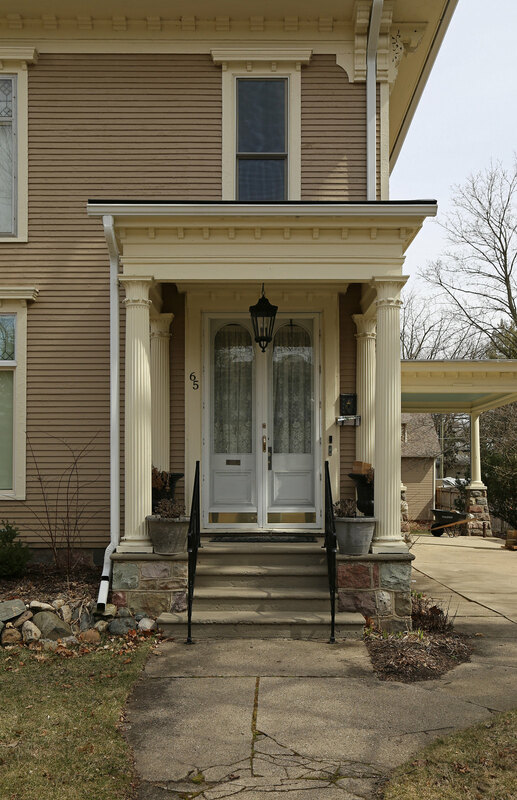 Identical doorways, each surrounded by sidelights and a transom, open onto both of this porch’s levels. Members of the Gore family, who built the dwelling, hailed from northern Virginia, where such porches are commonplace. Similar porches adorn farmhouses in the townships of Bratton, Franklin, Green, Scott, and Tiffin. 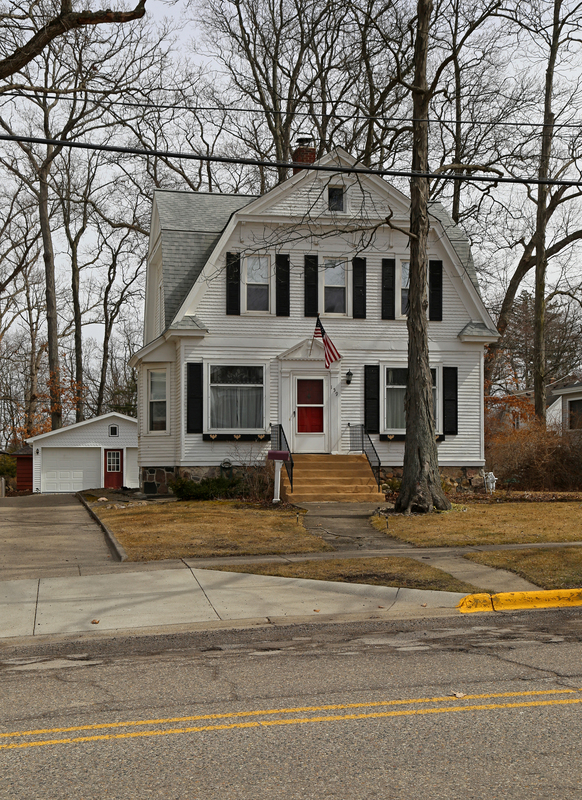 Also taking its inspiration from ancient Hellas is Liberty Township’s Gibboney House, a one-story, four-bay, L-shaped frame cottage with a pedimented porch and sidelight-flanked doorway. Gore House, circa 1845; Bratton Township. Gibboney House, circa 1850; Liberty Township. 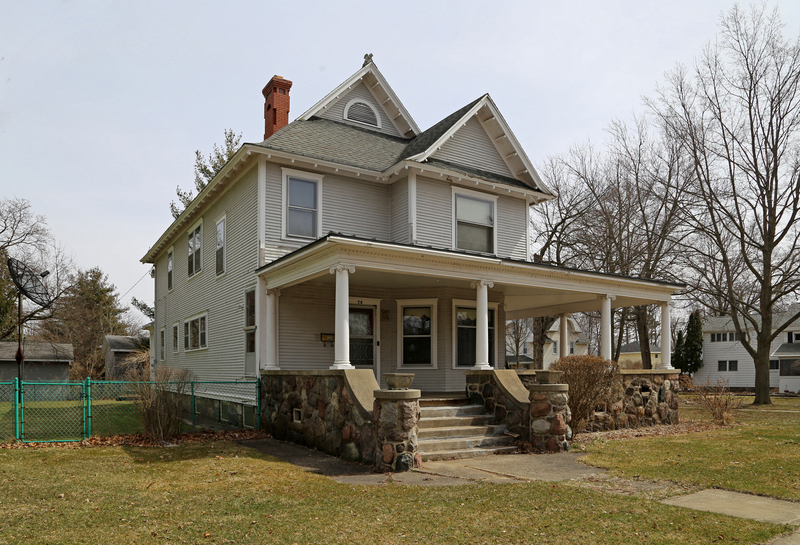 By far, the most inventive of rural Adams County’s abodes is the Oliver Tompkins House — known informally as the “Counterfeit House” — in Monroe Township. 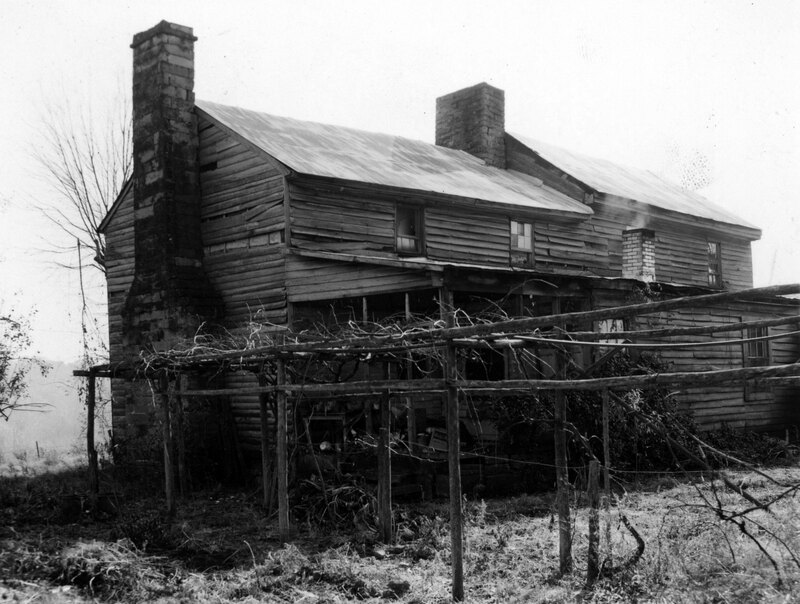 A counterfeiter by trade, Tompkins purchased a farm on Gift Ridge (not far from Buckeye Station) in 1840, then erected a home designed to conceal his moneymaking operation. In form, the structure is unique enough. It employs the usual center-hall plan, but its roof is hipped (rather than gabled), and its windows are framed by paneling and wide, crossette-endowed trim. 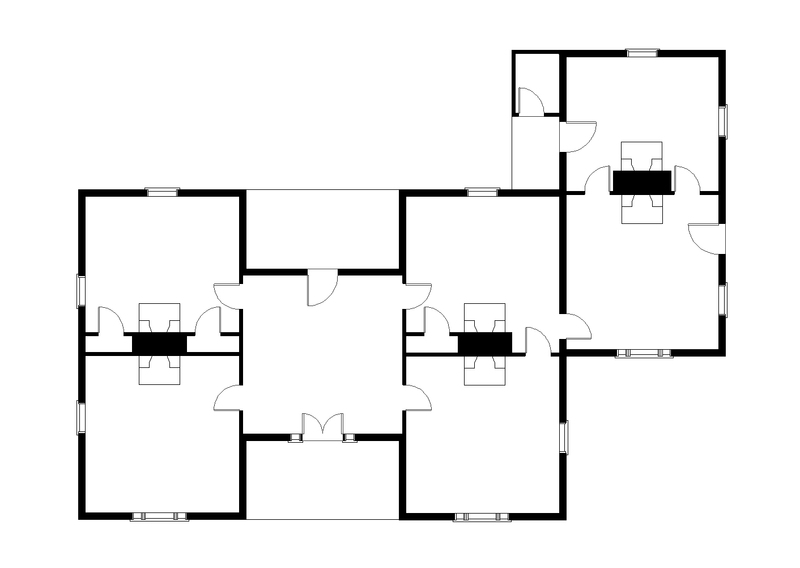 The chimneys’ stacks are turned 45 degrees from the perpendicular, and the central hallway terminates at a recessed, trabeated doorway (with sidelights and a transom). Tompkins outfitted his home with features intended to hide his scheme: deceptively locked doorknobs, a slot where patrons could insert cash, and a concealed second-floor room where the actual counterfeiting occurred. For decades, the Tompkins House doubled as a private residence and an impromptu museum. But now, alas, the building stands abandoned, overgrown, and tornado-damaged. Oliver Tompkins House ("Counterfeit House"), 1840; Monroe Township. Photo from Wikimedia Commons, courtesy of Aesopposea. 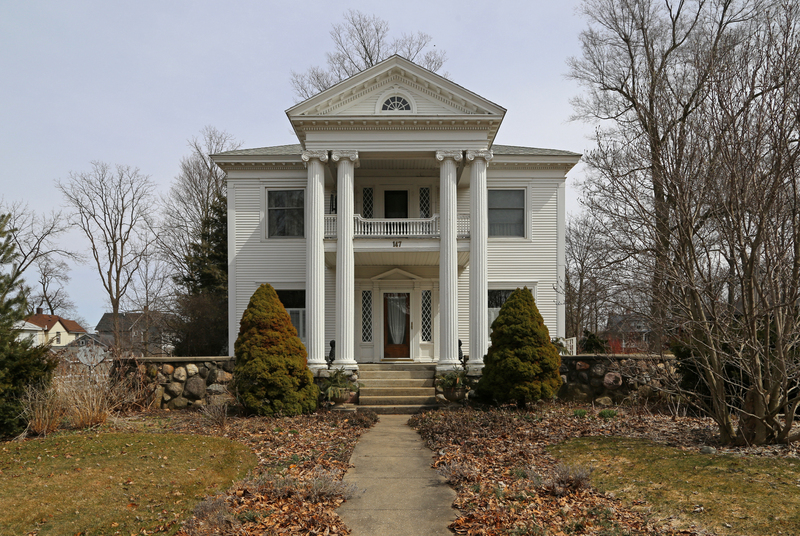 Outside West Union and Manchester, high-style Italianate structures are as rare as Greek Revival ones. 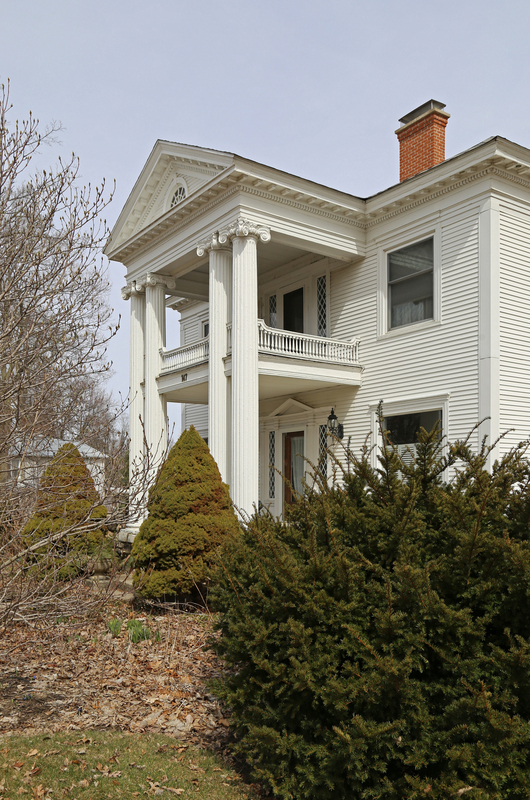 A few Adams County builders applied minor Italianate detailing — bracketed cornices and hip roofs, usually — to the common “I-house” form. 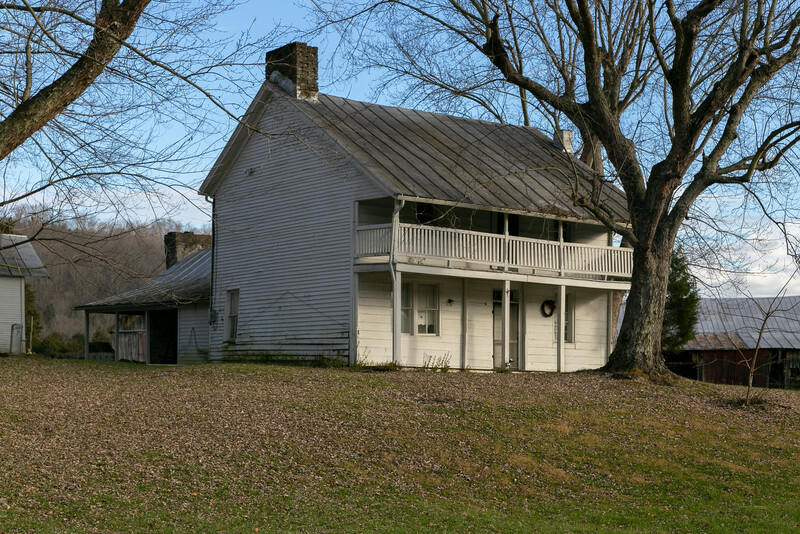 One farmhouse, built by the Grimes family amid Ohio River bottomland (not far from the site of Washington), managed to capture the irregularity that typifies the Italianate mode. This home, built of brick and restrained in its ornamentation, disappeared during construction of the Killen Generating Station. For the most part, the Italianate (and the Gothic) made an appearance only at the periphery — in minor details and porches, which often featured scrollwork, spandrels, and brackets. 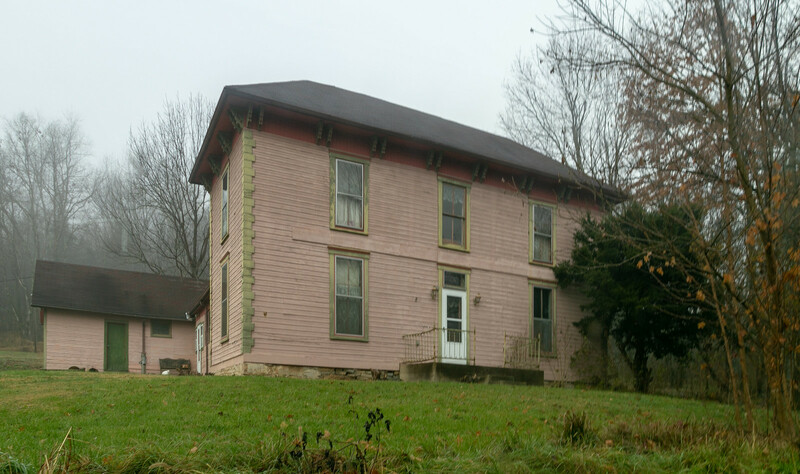 Italianate farmhouse, circa 1885; Scott Township. In rural Adams County, at least, most late-nineteenth-century homes are firmly astylistic. Elements associated with the greater “folk Victorian” vocabulary — exterior strapwork and shingling, stylized window trim, bargeboards and gable-end trusses, and spindlework—appear occasionally and in small numbers. A vacant balloon-frame farmhouse on State Route 136, in Liberty Township, employs most of these tropes. After about 1900, residual classical ornamentation again gained popularity. 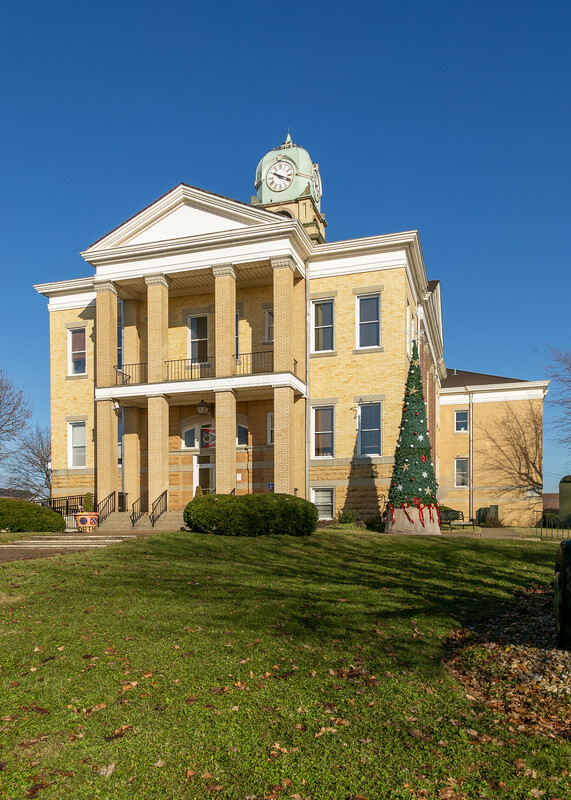 Nonetheless, the overwhelming majority of notable Adams County buildings date from the nineteenth — and not the twentieth—century. Abandoned farmhouse, circa 1890s; Liberty Township. Ubiquitous to such early, eaveless buildings is the rake board, the side elevation's equivalent of a fascia, more or less. In the absence of a roof overhang, rake boards protect the junction between a building's roof and its side walls from water infiltration. Though most common to masonry buildings (1), rake boards aren't unique to a particular construction method — log, frame, brick, and stone structures alike make use of them. William Knoles House; Chillicothe, Ross County, Ohio. A stupendous example of early-nineteenth-century construction practices. Note the rake boards, vertical proportions, and steeple-notched logs. 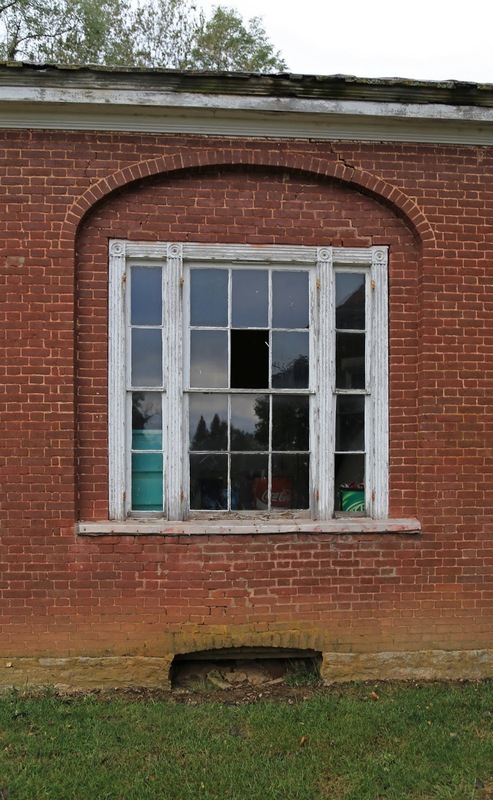 On masonry structures, rake boards tend to coexist, almost by necessity, with flush chimneys. Among higher-style Federal buildings, they occasionally feature dentils or scalloped carvings, and they often terminate, on the facade, at proper cornices. Travelers' Rest (1812); Greenfield, Highland County, Ohio. Early house; Clifton, Greene County, Ohio. This dwelling — bizarrely vertical, and almost tower-like, in its proportions — features the usual flush chimney and rake boards. Jacob Coy House; Beaver Creek Township, Greene County, Ohio. Coy, a Pennsylvanian, built this enormous log house in 1824. In its proportions (and its use of the site's terrain), it falls neatly into the Pennsylvania German tradition. 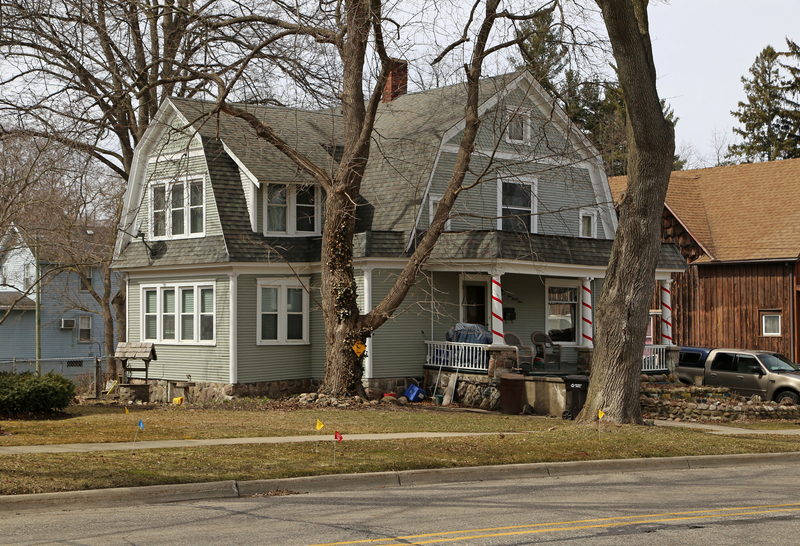 The rake boards, attic windows, and box cornice (barely visible) are typical. Photo by Sandra Shapiro, 1989, from the collection of Donald and Jean Hutslar. Kitchen wing, John Knott House (1828); Miami Township, Greene County, Ohio. The rake boards may this home's least noteworthy feature. Most fascinating are the two-story porch and divided ("Dutch") door. Abandoned "saltbox" house; Elizabethtown, Hamilton County, Ohio. Razed. Photo from the Miami Purchase Association collection; digitized by DAAPSpace. 1) Why? Largely because early masonry buildings were more likely to outlast frame and log ones. A few days ago, I spent an afternoon walking the streets of Hillsdale, Michigan — my adopted (and soon-to-be former) hometown. Like a great many small Midwestern cities, Hillsdale has endured its share of economic and cultural oscillations. The community, platted in the 1830s, enjoyed moderate prosperity in the nineteenth century (thanks, largely, to its status as county seat), then entered a full-fledged boom about the turn-of-the-century, when the railroad industry reached its zenith. The city suffered little in the postwar years, but more recent decades have brought stagnation (albeit stagnation of a moderate sort). Thankfully, the presence of Hillsdale College guarantees the community a modicum of vigor. Hillsdale retains an unusually fine housing stock — a smattering of Greek Revival holdouts, a few examples of the Gothic picturesque, and a bounty of Italianates. (If my experience is any indication, Michigan cities, in general, tend to be architectural treasure troves.) A majority of the town's homes, though, date from the thirty-year period spanning the presidencies of Cleveland and Coolidge — the 1890s, 1900s, and 1910s, when American cities underwent something of a building boom. Stylistically, this era was marked by a return to the classical. Already, by the 1890s, architects at the cutting edge of American design (to use a cliché) were eschewing Romanesque massiveness and ornate scrollwork for entablatures, pediments, dentils, and volutes. 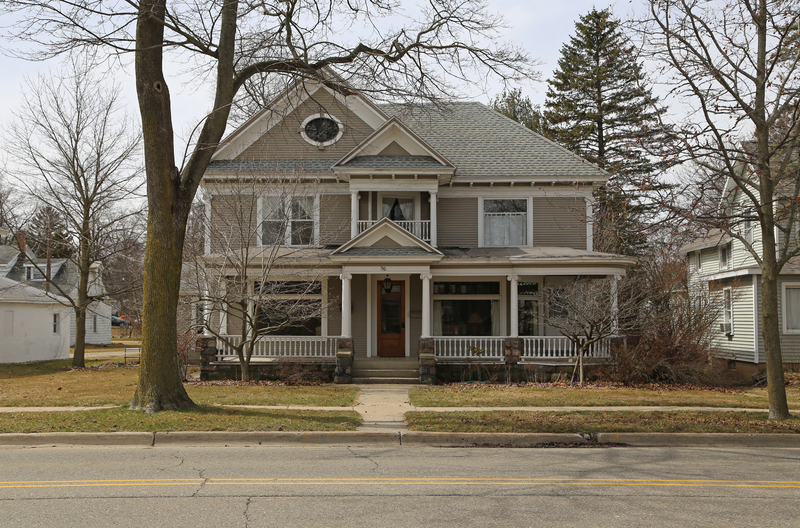 The turn-of-the-century popularity of classical forms is evident in Hillsdale, and evident, moreover, in the homes lining one of Hillsdale's streets. 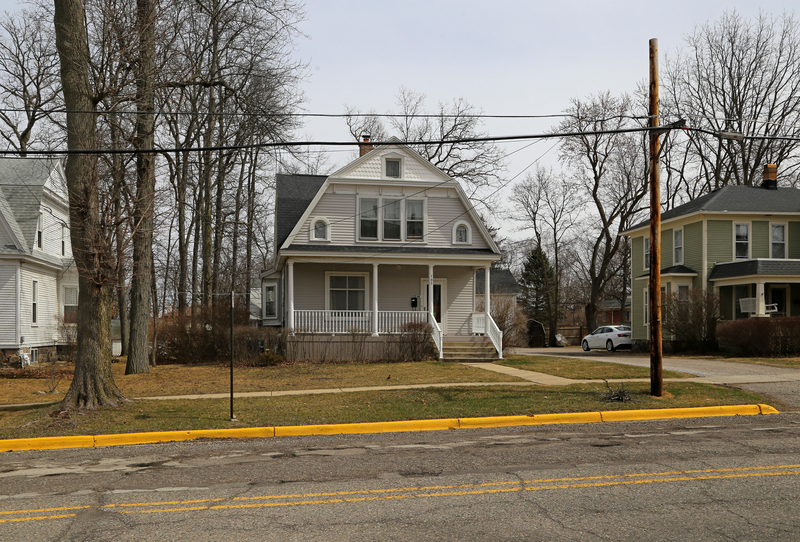 Once upon a time, Howell Street served as Hillsdale's primary north–south thoroughfare. It formed the focal point of the city's commercial activity, constituted one border of the courthouse square, and connected the community to Ohio and points farther south. It also witnessed quite a transformation during classicism's reintroduction. Some of Howell Street's homes only flirt with classicism. A few date from the 1860s, 1870s, and 1880s, when the Italianate style dominated. 99 Howell Street is a typical example—a one-and-a-half-story home of "upright-and-wing" form (so popular among the New Yorkers who dominated early Michigan), originally built in a vernacular Greek Revival–Italianate mode and updated, about 1900, with a vaguely Ionic porch. The porch's columns are disproportionately slender, and the volutes jut from the capitals at a 45-degree angle—a feature exclusive to the corner columns of Greek antecedents. 65 Howell Street — occupied, in 1894, by members of the Prideaux family — is a more developed building. An irregularly shaped frame dwelling of side-passage plan, it combines Italianate and Classical Revival details in a way that makes determining a construction date difficult. A bracket-supported cornice crowns each of the home's windows, many of which feature leaded glass. More interesting, perhaps, is the way the eaves are treated — chunky scroll brackets, pierced and paired at the corners; a divided frieze; and an abundance of smaller brackets which rather resemble classical dentils or modillions. Other homes in the vicinity were born in a state of classicism. In general, the earliest turn-of-the-century-era Classical Revival residences combined neoclassical ornamentation and irregular, picturesque late-Victorian forms. 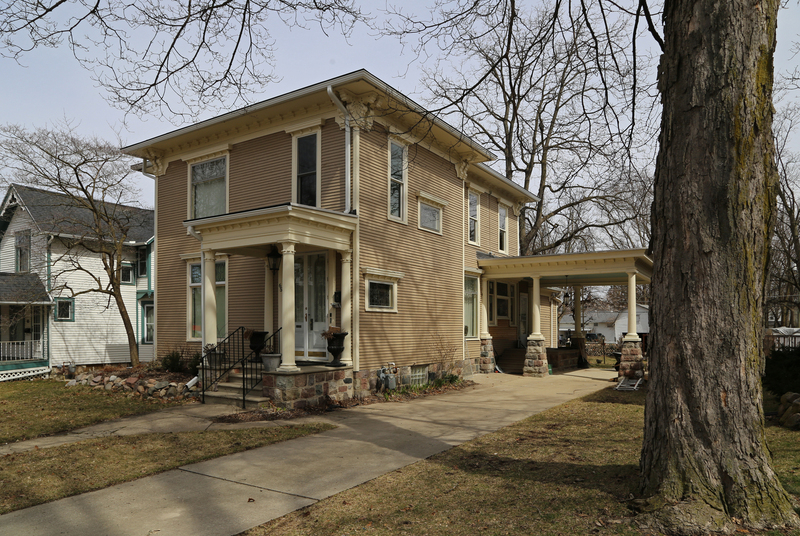 (The McAlesters classify such houses as the "free classic" subset of the Queen Anne style.) 93 Howell Street exemplifies this turn. In proper late-Victorian fashion, it's well-supplied with turrets and towers, but it lacks much extraneous adornment. Beyond the turret and the narrow frieze board running beneath its eaves, its only claim to a stylistic identity is its stumpy Ionic porch. In a similar — albeit later — vein is 75 Howell Street, another balloon-frame dwelling with an Ionic porch and an asymmetrical plan. This house seems to anticipate the Craftsman movement, with its purlin-esuqe modillions and double-slope roof. 96 Howell Street is one of the neighborhood's grander Classical Revival abodes. The omnipresent Ionic columns (and pilasters) may be awkwardly scaled, but the home's irregularity, entablature, modillions, elliptical (and keystone-surrounded) attic window, and two-story porches lend it an air of respectability. Near Howell Street's southern terminus lie a few gambrel-roofed homes. Though predominantly astylistic, they approach the classical. By far, the crowning classical jewel in the neighborhood's crown is 147 Howell Street. I'll let the photos speak for themselves. Reservoir-building is necessarily destructive. Foliage must be cleared, and topography graded, before water floods the site in question. Fields and fences drown, and entire landscapes disappear under muddy water. Worst of all (if I may flaunt my bias), the construction of dams tends to disproportionately affect historic buildings. Why? Because — in southwestern Ohio, especially — any locale's earliest settlements tended to cluster around its watercourses. Valleys often shelter a particular community's oldest homes and wealthiest farms. Inevitably, dam construction involves the obliteration of these things. One such casualty was a cluster of homes in southeastern Batavia Township, Clermont County, in and around the now-submerged hamlet of Elk Lick. William H. Harsha Lake, created in 1978, now covers the site of Elk Lick, itself commemorated only by an eponymous local road. The Richard Collins House's front (east) facade, viewed from Elk Lick Road. I discovered the Collins Farm by accident, one day, while browsing the University of Cincinnati's DAAPSpace media library. (In the 1990s, the university acquired the defunct Miami Purchase Association for Historic Preservation's collection, which it has partly digitized.) Among photos of familiar Clermont County structures, I found an intriguing cluster of images labeled "McGrath Complex." A bit of digging confirmed my suspicion — the buildings were long ago razed. Oddly enough, they receive no mention in the Ohio Historical Society's 1970 "Southwest Ohio Survey" report (which includes one Elk Lick house). More useful, but no less perplexing, is the error-laden East Fork Environmental Impact Statement issued by the Army Corps of Engineers in 1974. According to the report, the homes within the "McGrath Complex" were "[r]emoved from the site according to standard real estate procedures," with some hope for future preservation. This, alas, is nonsense. In reality, they were unceremoniously bulldozed. A few years after moving to Ohio — in either 1803 or 1805 — John funded the construction of a two-story stone residence. The structure was strikingly ancient-looking, with its two-bay facade and single-pen plan, and it scarcely differed, in form, from the log homes built by less-wealthy Ohioans of the same generation. Like a few other stone buildings in Clermont County, the John Collins House featured a massive interior-end chimney, a narrow frieze board, and rather skimpy boards which, as far as I can tell, simulated cornice returns. The John Collins House (circa 1805). Despite what local lore claims, this was not Ohio's oldest stone building. A stone's throw (no pun intended) from John Collins's statehood-era dwelling stood a much larger, grandiose residence — reportedly commissioned by Richard Collins (1797–1855), John's son, who acquired the family farm in 1853 after a storied career. (The younger Collins practiced law in Hillsboro, Ohio; represented Highland County in Ohio's government; and operated a dry-goods store in Maysville, Kentucky.) Assuming the linked obituary's chronology is correct, Collins built his home in 1853, 1854, or 1855 — all believable construction dates, given the building's appearance. Richard Collins's grand Grecian edifice. The house's builder made use of a plan common enough in southwestern Ohio — four rooms arranged around a central hallway, with chimneys placed at the periphery (and, thus, a fireplace in each major room). Here, though, the mundaneness stops. Rather than being two stories in height, the Richard Collins House squeezed an additional half-story, lit by low windows, under its bizarrely shallow gable roof. The home's dominant feature was, of course, its massive Ionic portico, which sheltered first- and second-floor doorways ornamented in typical Greek Revival fashion, with sidelights, transoms, pilasters, and entablatures. The second-floor entrance led onto a small, iron-balustraded balcony structurally independent from the portico itself — not an uncommon arrangement among grander classically inspired homes. Brickwork underneath the eaves simulated an denticulate entablature. 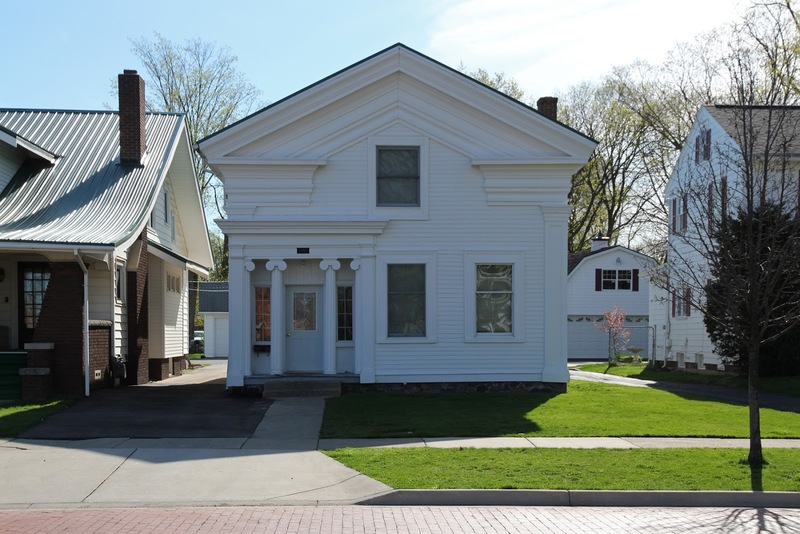 As a work of art, the Richard Collins House was, I think, less successful than a great many Greek Revival homes in northeastern Ohio. (In general, the New Englanders who inhabited the Western Reserve built more faithfully in the Greek idiom than did their southern-Ohio counterparts.) Its size made it ponderous, and its sparsely adorned eaves (i.e., the absence of a proper entablature) rendered it bottom-heavy. Still, it overshadowed almost every building in the vicinity, and its ambitious design placed it among the great Greek Revival homes of the Cincinnati region. 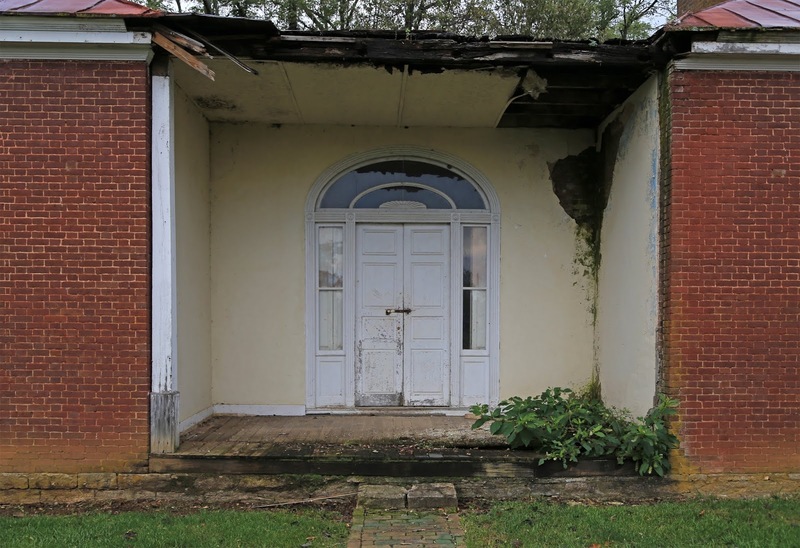 Both John's and Richard's houses were well worth preserving, as even the Army Corps of Engineers noted, but their destruction isn't surprising. Relocating a masonry building is a bloody difficult task; I've heard stories of brick homes crumbling to pieces despite movers' best efforts. What replaced the dwellings of John and Richard Collins? Have a look. William H. Harsha Lake (looking north), seen from the East Fork State Park Beach. Photo sourced from Google Maps. The Collins family's farm occupied land near the center of the image. Sturgis, Michigan, is a peculiar city — it's county-seat-sized, with an appropriately healthy economy and a splendid stock of nineteenth-century buildings, but it lies at the corner of its county, rather far from the usual sources of vitality. (More than likely, the community's survival is a consequence of its proximity to the Indiana Toll Road.) Just south of the business district, on a charming brick-paved street, stands an equally head-scratching home. They say that the Greek Revival is a masculine style. (1) If so, this is the Arnold Schwarzenegger of Greco-American homes, with a great rippling, bulging bicep of an entablature. Now, most Greek Revival homes — whether or not their builders adhered rigidly to classical models — possess some grace; but others collapse (metaphorically, of course) under the weight of their ponderous entablatures. This house, it seems, falls into the latter category (though I'm rather partial to the doorway). The doorway is also a purist's nightmare. The columns are too slender, their capitals are too large, and the engaged, semicircular pilasters slam awkwardly into the flat pilasters supporting the entablature. What do I know about the house's history? Relatively little. In 1893, it belonged to a "Mrs. H. Church." Mrs. Church may have been Emma (1834–1912), wife of Henry Seymour Church (1831–1910), a native of upstate New York (America's Greek Revival capital, if I may say so). At the time of the 1880 census, the Churches lived alone, and Henry worked as a grocer. In all likelihood, Henry was too young to have commissioned this home, (2) so the identity of its builder remains a mystery. Kathryn Eckert's excellent Buildings of Michigan neglects to mention it, and I have no access to the Michigan Historic Preservation Office's archives. So, as with so many blog posts, I'll end with a shrug of bewilderment. 1) I can't entirely agree with this assertion. The Greek Revival mode indeed emphasizes massiveness and stolidity — at least, more than, say, the Gothic and late Victorian styles do. But Davis, Eastlake, and Shaw would surely object to our labeling their work unmanly. 2) I'd estimate a construction date in the 1840s (at the earliest) or the early 1850s (more likely). Given that Henry Church reached adulthood about 1850, it's conceivable — but, again, unlikely — that he bore responsibility for erecting the house. 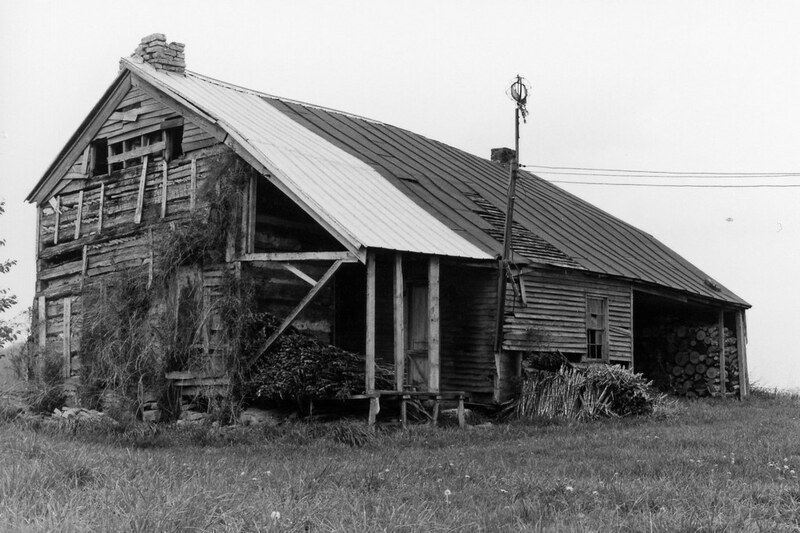 Unlike Kentucky, Tennessee, and other states south of the Ohio River and west of the Appalachians, Ohio boasts relatively few double-pen log buildings. (For those unversed in the arcane art of log-divining, a double-pen building is one which contains two structurally independent units, or pens. *) One of the Buckeye State's finest double-pen dwellings stood, appropriately enough, in one of its most "Southern" counties (geographically and culturally) — Adams — just north of West Union, the county seat. 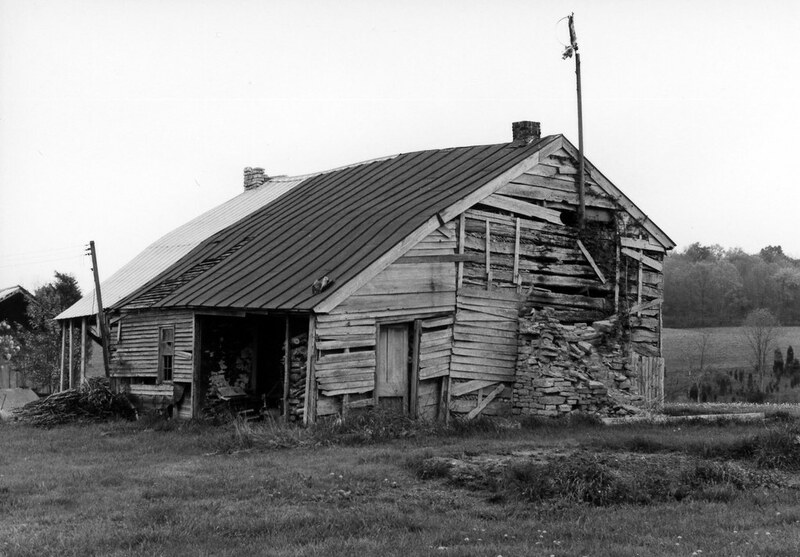 Nestled among billowing pastureland within an agriculturally deficient region known, historically, as the "white oak barrens," the house languished in obscurity and decrepitude until Stephen Kelley, president of the Adams County Historical Society, photographed it in 1977. Kelley's images found their way into Donald Hutslar's hands, and thence into two books (this and this). 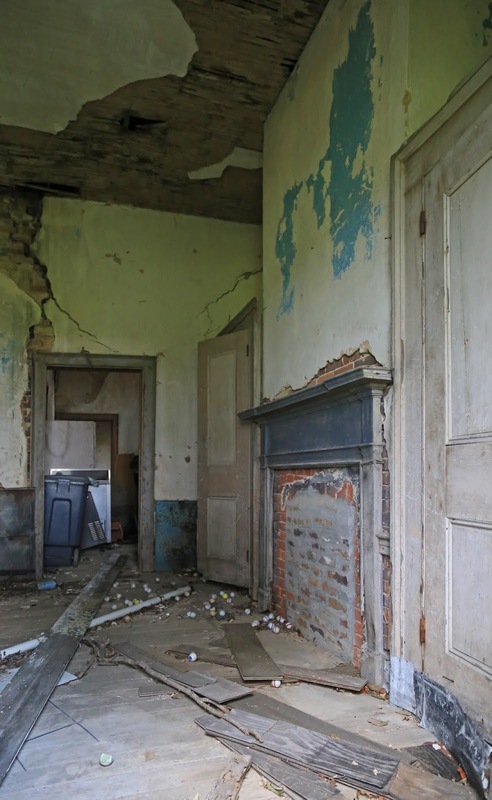 It's scarcely surprising, then, that state and national surveys of historic buildings neglected to include it — and shall always neglect to include it, since the house disappeared in the 1990s. The house's front (northwest) elevation. Image by Stephen Kelley, 1977, from the collection of Donald and Jean Hutslar. The home was an utterly classic double-pen structure — precisely the sort of building I'd expect to find within the earlier-settled portions of the Upland South. It made use of two one-and-a-half-story pens, each constructed of steeple-notched logs and adorned with a single window opening. It featured two massive rubble-stone chimneys — one exterior, and one interior (with an exposed firebox). In all likelihood, the passage between the pens was always enclosed (unlike in the case of the archetypal "dogtrot" house), and the braced-frame rear rooms, which lent the structure a "saltbox" roofline, might have been planned at the time of construction. The rear (southeast) and side elevations. Note the square attic windows, rake boards, and cantilevered porch framing. I must say, I'm a bit baffled by the pole-mounted hoop. Was it a DIY television antenna? A massive dream-catcher? A homing device for extraterrestrial spacecraft? Kelley, it seems, failed to photograph the interior, but he did have the foresight to sketch a floor plan, which I've adapted into a proper CAD rendering. In some ways, the house's oddest feature was its staircase. More often than not, early inhabitants of Ohio's southern half jammed their stairways into the space between the fireplace and exterior wall. This house's builder, by contrast, placed the staircase within the "breezeway," but left it accessible only from the home's rear room. This suggests two possibilities — that (a) the building underwent a massive interior remodeling sometime in the nineteenth century, or that (b) the frame rear portion and the log pens were contemporaneous. Either possibility seems perfectly likely. 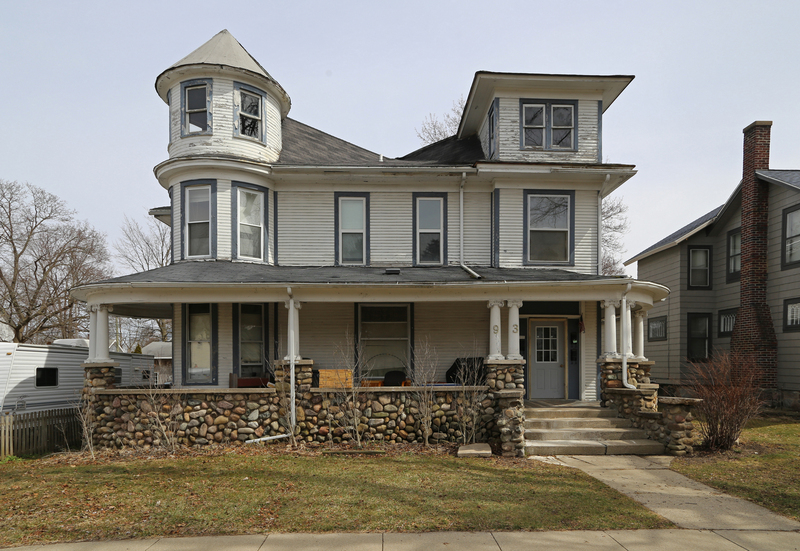 So, the house's origin will remain a mystery — at least, until someone pays a visit to Adams County's courthouse and slogs through nineteenth-century tax records. I'll end my post with a rendering of how the house may have appeared in better days. 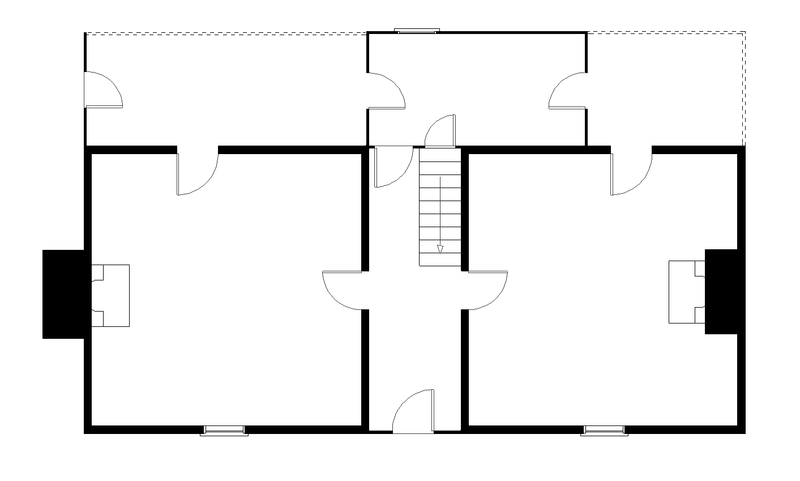 The house reconstructed in SketchUp, from the floor plan pictured above. * Like all definitions, this one is subject to exception. Some of Ohio's seeming double-pen buildings — Brown County's Erastus Atkins House, for instance — are, in reality, unified structures whose rooms are divided by interlocked log walls. Text and photos by Christopher Riley, unless otherwise noted. Simple theme. Powered by Blogger.